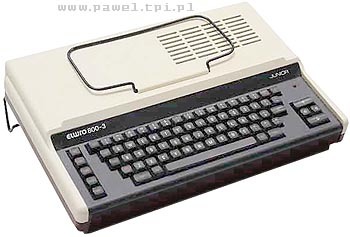 The Elwro 800 series was designed in 1985 by people from the Automatics Institute of Technical University in Poznan, following the request of Polish Ministry of Education. � Appropriate for school use. The computer went into production in 1986 in Elwro Electronic Factory of Wroclaw, Poland. It was fully Spectrum compatible. Designers also added network capability to access the shared printers and floppy drives. The operating system was CP/J, a modified version of CP/M allowing networks called Junet to be managed. The 800 Junior could could work under the CP/M 2.2. Planned production volume for 1986 was 500 pieces. Elwro 800-3 was a off-line version students or teachers could use. In 1990, a Junior 804 prototype was built. It had a built-in 3.5" floppy disc drive and looked like a Commodore 128. Elwro factory closed its doors in late eighties. Assets were sold to Siemens. Thanks to Pawel Kubacki from Poland for information and pictures. see more elwro 800 Junior Ebay auctions !